My caption was "No wires or batteries? How in the world does it operate?" Some editor at Globe decided to revise it as above. I guess I'm prejudiced, but I think my caption was far superior. This was 1990, by the way. These days, no wires or batteries would pose no problem. I'd also like to point out that my drawing was altered to fit their allotted space. 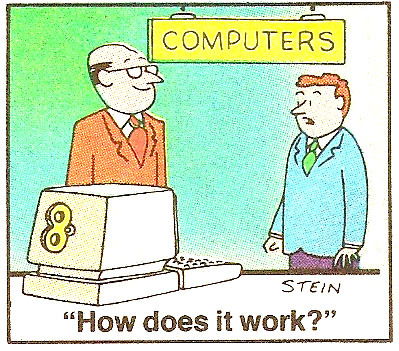 Note how the repositioned "COMPUTERS" sign juts right into the salesman's head! Your caption would have been better. And funnier.